To register please use the Registration Form at the end of this page. 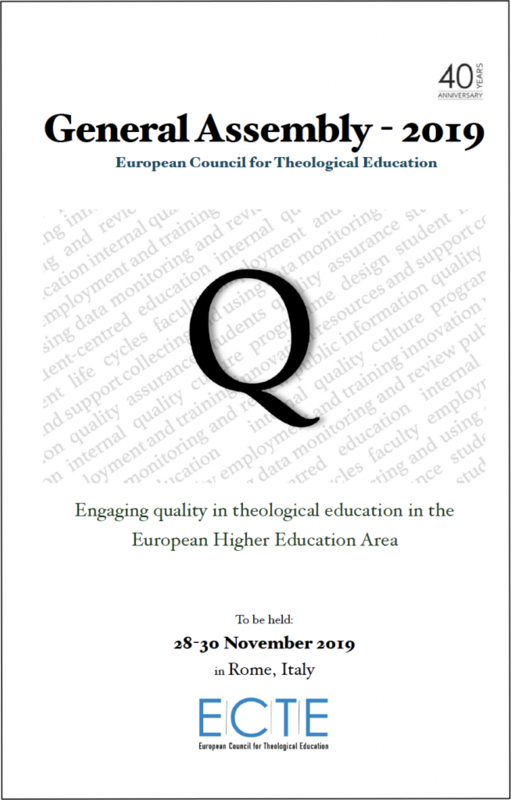 The 2019 ECTE General Assembly will focus on quality in theological education in the European Higher Education Area (EHEA). This is a great opportunity to dialogue around issues of quality assurance and accreditation with experts and peers. Particular attention will be given to the standards outlined in the European Standards and Guidelines (ESG) and to the implications for the ECTE of being being reviewed by the ENQA for inclusion in the European Quality Assurance Register Quality (EQAR). We are pleased to welcome as our speakers Goran Dakovic (Reviews Manager of Eurpean Network for Quality Assurance – ENQA), Colin Tuck (Director European Quality Assurance Register – EQAR), Riccardo Cinquegrani (Director of Holy See’s Agency for the Evaluation and Promotion of Quality in Ecclesiastical Universities and Faculties – AVEPRO), QA officers from university-accredited theological schools in Europe and ECTE experts. Given the student-centred education focus groups, we strongly encourage each school to bring along a student representative. Given the specific training and the number of topics that will be dealt with, each school is advised to bring along your QA officer or person responsible for accreditation oversight. Given the location in the heart of Rome, why not also treat your spouse to a weekend in the Eternal City? Spouses are welcome to all meetings but are also free to roam Rome. Our main venue will be the Istituto Maria Bambina convent with a fantastic view over St. Peter’s square (Via San Paolo VI, 21 Rome). We will have all our meetings and noon meal here. Evening meals will be organised in downtown Rome. The convent has 35 single and 30 double rooms that will be assigned on a first come, first served basis. Further low cost accommodation is available in shared rooms in a hostel next door (15 places). 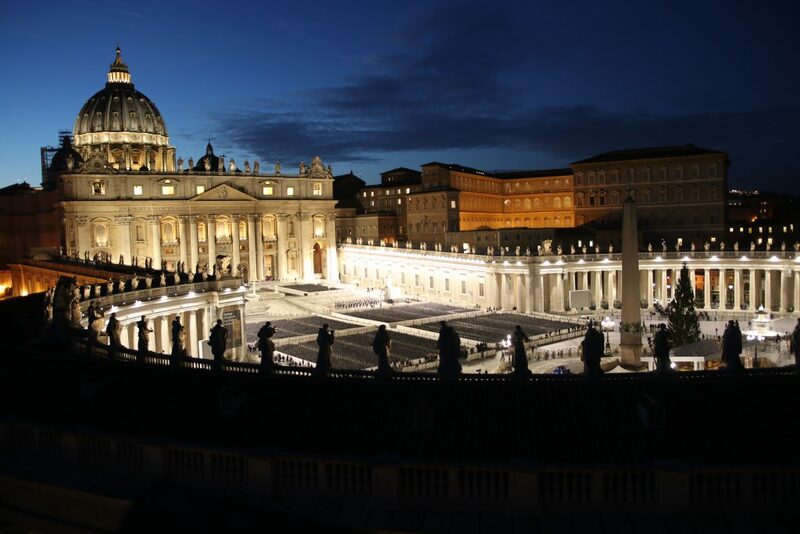 Participants are also free to reserve accommodation independently in hotels, as long as they stay within walking distance of St. Peter’s Square (B&B formulas should be chosen as all meals will be provided). An optional longer walking tour of Rome is available for those wishing to stay an extra day. This will cost €100 and include the tour, the evening meal and an additional night in your chosen accommodation (this applies only if you have booked your room through the ECTE; if you have booked your accommodation separately, the tour and meal cost €40). Please note room availability is limited and will be assigned on a first come, first served basis. This registration form will be updated once options are full. (indicate name and relationship, e.g. spouse, colleague, etc). The €100 fee for the Rome tour includes the tour, evening meal of Saturday and an additional night in your chosen accommodation if you have booked through the ECTE (Saturday, 30 November). If you have booked your own accommodation separately, please choose option 3 (€40 for the tour and meal alone). Some focus groups will be scheduled at the same time, so it may not be possible to attend all selected (see programme). Popular topics will be repeated Saturday morning. Please provide your flight details. If not available yet, please email them to office@ecte.eu. This is for information purposes only as the ECTE is not arranging shuttles into Rome.